The NEC IT2840D is a true multi-function digital copier. 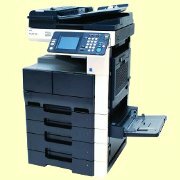 This true multifunction product supports high-volume black and white printing and low cost operation throught its complete process management, standard features that include printing, faxing and scanning and its finishing features. The IT2840D includes an easy to use three-way tilting control panel with large function keys and an intuitive-touch screen command interface. It also includes account management with up to 1,000 user accounts and authentication management for network integration . ﻿Contact us﻿ for pricing on this model or its supplies!